This article is about the band. For their debut album, see Huey Lewis and the News (album). Huey Lewis and the News is an American pop rock band based in San Francisco, California. They had a run of hit singles during the 1980s and early 1990s, eventually scoring a total of 19 top ten singles across the Billboard Hot 100, Adult Contemporary, and Mainstream Rock charts. Their greatest success was in the 1980s with the number-one album, Sports, coupled with a series of highly successful MTV videos. Their worldwide fame expanded when the song "The Power of Love" was featured as a key track in the film Back to the Future (in which Lewis had a cameo appearance), became a number-one hit, and was nominated for an Academy Award. The News combined a rock (and sometimes, a "blues-rock") backing with soul and doo-wop-influenced harmony vocals and Lewis' voice. In 1972 singer/harmonica player Huey Lewis (then billed as Huey Louis) and keyboardist Sean Hopper joined the Bay Area jazz-funk band Clover. Clover recorded several albums in the 1970s, and in the middle of the decade transplanted themselves to England to become part of the UK pub rock scene for a time. Without Lewis (but with Hopper), they eventually became the original backing band for Elvis Costello's first album My Aim Is True. Lewis also worked with Irish band Thin Lizzy, contributing harmonica to the song "Baby Drives Me Crazy", recorded onstage for the Live and Dangerous album. Lizzy bassist/vocalist Phil Lynott introduces Lewis by name during the song. The band returned to the Bay Area by the end of the 1970s. Clover's main competition in the Bay Area jazz-funk scene was a band called Soundhole, whose members included drummer Bill Gibson, saxophonist/guitarist Johnny Colla, and bassist Mario Cipollina (younger brother of John Cipollina). Like Clover, Soundhole had spent time backing the famous singer and recording artist, Van Morrison. After getting a singles contract from Phonogram Records in 1978, Huey Lewis recruited Hopper, Gibson, Colla, and Cippolina to form a new group, Huey Lewis & The American Express. Though they played gigs under this name, in 1979 they recorded and released a single simply as "American Express". The single, "Exodisco" (a disco version of the theme from the film Exodus) was largely ignored. The B-side of this record, "Kick Back", was a song that had previously been performed live by Lewis and his former band, Clover. In 1979 the band wooed guitarist Chris Hayes and moved to Chrysalis Records which occurred when their demo tape was heard by Pablo Cruise manager Bob Brown, who helped them land a record deal with the label. Chrysalis did not like the name "American Express", fearing trademark infringement charges from the credit card company, so the band changed their name. Later in 1980, the band issued their first studio album, a self-titled LP, Huey Lewis and the News. It went largely unnoticed. In 1982, the band released their second studio album, the self-produced Picture This. The album turned gold, fueled by the breakout success of the hit single "Do You Believe in Love", written by former Clover producer Mutt Lange. Largely because of the single, the album remained on the Billboard 200 album chart for 35 weeks and peaked at No. 13. The follow-up singles from Picture This, "Hope You Love Me Like You Say You Do" and "Workin' for a Livin'", followed with limited success. Due to record label delays on the release of their third studio album, Sports, Huey Lewis and the News was back to square one in late 1983, touring small clubs in a bus to promote the record (eventually known as the "Workin' for a Livin'" tour). The new album initially hit number 6 in the U.S. when first released. However, Sports slowly became a number-one hit in 1984 and multi-platinum success in 1985, thanks to the band's frequent touring and a series of videos that received heavy MTV airplay. Four singles from the album reached the top ten of the Billboard Hot 100: "Heart and Soul" reached No. 8, while "I Want a New Drug", "The Heart of Rock & Roll", and "If This Is It" all reached number 6. The album has sold over 10 million copies in the U.S. alone. Their song "The Power of Love" was a number-one U.S. hit and featured in the 1985 film Back to the Future, for which they also recorded the song, "Back in Time". Lewis has a cameo appearance in the film as a faculty member who rejects Marty McFly's band's audition for the school's "Battle of the Bands" contest. As an inside joke, the piece the band plays is an instrumental heavy metal version of "The Power of Love" (Lewis's response: "Hold it, fellas ... I'm afraid you're just too darn loud"). "The Power of Love" was nominated for an Academy Award. Following the success of "The Power of Love" and Back to the Future, Huey Lewis and the News released their fourth studio album, Fore! in 1986. Fore! followed the success of Sports and reached number-one on the Billboard 200. The album spawned the number-one singles, "Stuck with You" and "Jacob's Ladder" as well as the mainstream rock hit "Hip to Be Square". In all, the album had five top-ten singles on the Billboard Hot 100 and was certified triple platinum. The band continued to tour throughout 1987, and released Small World in 1988. After the previous two multi-platinum albums, Small World was considered 'noticeably weaker', peaking at No. 11 and only going platinum. The album had one top ten single, "Perfect World", which reached No. 3 on the pop chart. At the end of the Small World tour in 1989, the band took a break from recording and heavy touring and parted ways with Chrysalis Records. In 1991, they released Hard at Play on the EMI label, which went back to the R&B/rock sound of their earlier albums, and released the hit singles, "Couple Days Off" (No. 11) and "It Hit Me Like a Hammer" (No. 21). The album was certified Gold (eventually hitting the one million sales mark) and the band headlined another world tour in support of the release, which would be their last album of new material for a decade. The band once again changed labels, this time signing with Elektra Records, releasing a cover album in 1994 called Four Chords & Several Years Ago featuring doo-wop and rock songs from the 1950s and 1960s. This was the last album released with bassist Mario Cipollina, who left the band after the Four Chords & Several Years Ago world tour ended. The album charted on the Billboard 200 and had two hits on adult contemporary radio. In early 1996, the band released their first greatest hits album, Time Flies, which focused primarily on the releases from Picture This, Sports, and Fore!, and included four new tracks. The band's lineup has changed significantly since its heyday. Bassist Mario Cipollina left the band in early 1995 shortly after completing the first leg of the tour for 1994's Four Chords and Several Years Ago album. His replacement since that time has been bassist John Pierce. 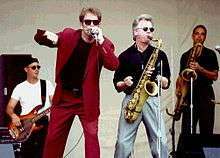 The Tower of Power, which often served as the band's horn section in the 1980s, ceased their work with the band in 1994. Horn players Marvin McFadden, Ron Stallings and Rob Sudduth joined the group in their place. In early 2000, Chris Hayes left the News to spend more time with his family, though he performed on their 2001 album Plan B. Stef Burns replaced Hayes, although guitarists Tal Morris and James Harrah have also filled in when Burns has had other commitments. On April 13, 2009, Stallings died from a hard-fought battle with multiple myeloma. After Lewis's co-starring role in the 2000 film Duets, with Gwyneth Paltrow (in which they performed their hit cover of "Cruisin'"), the News released their first album in seven years, Plan B, on Jive Records in 2001. It only briefly made the charts, while the lead single, "Let Her Go & Start Over", became a minor adult contemporary hit. The band continues to tour regularly, playing around 70 dates a year. In December 2004, Huey Lewis and the News recorded the live album, Live at 25, at the Sierra Nevada Brewing Company in Chico, California, which celebrated their 25th anniversary as a band. In 2008, they recorded the theme song to the action-comedy film Pineapple Express. The song is played over the end credits of the film and appears on the film's soundtrack album. The band returned to the studio in 2010, recording their first album of new material in nearly a decade. The album, entitled Soulsville, is a Stax Records tribute album recorded at the legendary Ardent Studios. A 30th Anniversary Edition of Sports, which included newly remastered tracks and a second disc featuring live versions of every song from the album, was released in May 2013. In 1984, Ray Parker Jr. was signed by the producers of Ghostbusters to develop the film's title song. Later that year, Huey Lewis and the News sued Parker, citing the similarities between the "Ghostbusters" song and their earlier hit "I Want a New Drug". According to Huey Lewis and the News, this was especially damaging to them since "Ghostbusters" was so popular, rising to number one on the charts for three weeks. The dispute was ultimately settled out of court. Lewis has stated that his experiences with the producers of Ghostbusters were indirectly responsible for getting involved in the 1985 movie Back to the Future. In the 2001 Behind the Music special, Huey Lewis stated: "The offensive part was not so much that Ray Parker Jr. had ripped this song off, it was kind of symbolic of an industry that wants something – they wanted our wave, and they wanted to buy it. ... [I]t's not for sale. ... In the end, I suppose they were right. I suppose it was for sale, because, basically, they bought it." As a result of this statement, Parker filed a suit against Lewis, claiming he violated the settlement's confidentiality agreement and sought an unspecified amount of compensatory and punitive damages as well as attorney fees. An issue of Premiere magazine would later feature an anniversary article about the movie Ghostbusters. In that article, the filmmakers admit to using the song "I Want a New Drug" as temporary background music in many scenes. They then said that they had made an offer to Huey Lewis and the News to write the main theme, but the band declined. The filmmakers then provided Ray Parker Jr. film footage – with the Huey Lewis song in the background – to aid Parker in writing the theme song. "Do you like Huey Lewis & The News? Their early work was a little too 'new-wave' for my taste, but when 'Sports' came out in '83, I think they really came into their own – both commercially and artistically. The whole album has a clear, crisp sound, and a new sheen of consummate professionalism that really gives the songs a big boost. He's been compared to Elvis Costello, but I think Huey has a far more bitter, cynical sense of humor. In '87, Huey released this, 'Fore', their most accomplished album. I think their undisputed masterpiece is 'Hip to Be Square', a song so catchy most people probably don't listen to the lyrics – but they should! Because it's not just about the pleasures of conformity, and the importance of trends, it's also a personal statement about the band itself!" "Hip to Be Square" was initially intended to be on the soundtrack album, but was removed from the album due to lack of publishing rights. As a result, Koch Records were forced to recall approximately 100,000 copies of the album which were destroyed. Koch Records president Bob Frank said, "As a result of the violent nature of the film, Huey Lewis's management decided not to give the soundtrack clearance." Lewis' manager Bob Brown claimed that the musician had not seen the film and that "we knew nothing about a soundtrack album. They just went ahead and put the cut on there. I think what they're trying to do is drum up publicity for themselves." In April 2013, to mark the 30th anniversary of the band's album Sports, comedy video website Funny or Die created a parody of the axe murder scene featuring Huey Lewis as Patrick Bateman and "Weird Al" Yankovic (who parodied "I Want A New Drug" as "I Want A New Duck" years before) as Paul Allen. As an extra gag, in place of the band's Fore! album, Huey plays a DVD for Al of American Psycho. The band has sold over an estimated 30 million records worldwide according to an interview with Johnny Colla in 2006. Their 1983 album Sports has sold 10 million copies in the United States according to the VH1 Behind the Music show on Huey Lewis and the News (though it has only been certified seven times Platinum by the RIAA). Also in 1986, the Grammy for Best Pop Performance by a Duo or Group with Vocal was won by "We Are the World" performed by USA for Africa, in which Huey Lewis and the News were participants; however, this award went to the song's producer, Quincy Jones, and not to any of the artists. The songs "The Heart of Rock & Roll" and "The Power of Love" were nominated for Grammy Awards for Record of the Year, in 1985 and 1986, respectively. "The Power of Love" (from the film Back to the Future), earned Chris Hayes, Johnny Colla and Huey Lewis (the songs composers), an Academy Award nomination for Best Original Song in 1986. The band received the award for Best International Group at the 1986 Brit Awards. The band's two biggest selling hits "The Power of Love" and "I Want a New Drug" were both million selling singles in the U.S., certified Gold by the RIAA. 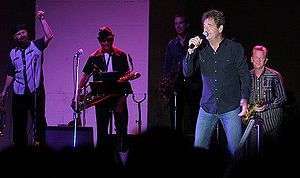 Huey Lewis and the News are the recipients of 30 Californian (formerly Bay Area Music) Awards. All five albums released by the band between 1982 and 1991 reached the Top 30 on the Billboard 200 album chart and have been certified either Gold, Platinum, or Multi-platinum. ↑ Sheff, David (August 16, 1982). "To Get His News on the Air, Rocker Huey Lewis Had to Wait for a Commercial Break". People. ↑ Erlewine, Stephen Thomas. "Huey Lewis & the News Small World Review". All Music. Retrieved May 27, 2015. ↑ Bateman, Patrick (May 27, 2010). "Reviews Music". Patrick Bateman. Retrieved May 27, 2015. ↑ Vaziri, Aidin (April 16, 2009). "Ron Stallings, prominent saxophonist, dies". San Francisco Chronicle. Retrieved May 27, 2015. ↑ "Seth Rogen Brings Huey Lewis Aboard Pineapple Express". Stereogum. December 3, 2007. Retrieved April 19, 2014. ↑ Russo, Daniel (January 22, 2010). "Huey Lewis and the News at Ardent Studios". ardentstudios.com. Retrieved January 29, 2010. ↑ Lewis, Huey (May 11, 2010). "Huey Lewis". The Tavis Smiley Show (Interview: Video & transcript). Los Angeles: KCET. Retrieved January 12, 2011. ↑ "Ron Stallings, prominent saxophonist, dies". ↑ "Band Member Bios - Huey Lewis and the News.". ↑ "Ray Parker, Jr.: Information from". Answers.com. Retrieved April 19, 2014. ↑ vanHorn, Teri (March 21, 2001). "Ray Parker Jr. Suing Huey Lewis Over 'Ghostbusters' Comment. VH1.com. Retrieved February 15, 2007. ↑ "Who Ya Gonna Call? Ghostbusters Exclusive! Inside story of a comedy classic". Premiere Magazine. June 2004. 1 2 3 "American Psycho soundtrack in hot water". The Guardian. London. April 13, 2000. Retrieved July 27, 2010. ↑ "American Psycho with Huey Lewis and Weird Al from Huey Lewis, Al Yankovic, PatB, NickCorirossi, Charles Ingram, Jason Carden, Ben Sheehan, and BoTown Sound". Funnyordie.com. April 3, 2013. Retrieved April 19, 2014. ↑ Cavacini, Michael (July 15, 2014). "A Conversation With Johnny Colla – Part 1". Michael Cavacini. Retrieved May 27, 2015. ↑ Cavacini, Michael (August 4, 2014). "A Conversation With Johnny Colla – Part 2". Michael Cavacini. Retrieved May 27, 2015. ↑ RIAA Gold and Platinum Searchable Database - Huey Lewis & the News singles. Retrieved October 25, 2008.